The easiest parsley pesto made with simple ingredients and ready in only 2 minutes! 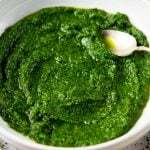 You can use this pesto in so many ways from pasta, with fish or chicken, in salads, sandwiches or as a dip. It's the easiest way to add a ton of flavor to your food! Place all ingredients in a bowl and blitz until smooth with an immersion blender. If using a mortar and pestle add it to the mortar and pound until smooth. Season and use as required. Yes, you can freeze pesto. Transfer it into an ice cube tray or store it in small plastic containers and freeze for up to 6 months.